After WW1 Charles de Gaulle understood that the next war would be a mechanical one but nobody listened to him. In June 1940 he was under-secretary of Defence and, refusing the armistice with Germany, he went to London and called for continuing the war with the UK against Germany (Americans must remember that at this time the USA were NOT at war : the war was declared only after Pearl Harbor in December 1941, more than two years after its beginning for France in September 1939). De Gaulle thought that France could not be independent unless she had her own full military capacity, i.e. nuclear weapons. In spite of the US refusing to cooperate (by providing computer equipment), France succeeded in 1963. Then in 1966 she withdrew not from NATO but from NATO's military organization. Gaullism is not something new in French history and it relates to "Bonapartisme" : an authentic democracy with a strong state and a very active foreign policy in the name of universal ideas. More about de Gaulle. Among the many books about de Gaulle (including his owns), read an excellent book about de Gaulle "off the record" by Peyrefitte. 1920s : the insistance of France to receive from Germany the heavy financial compensations resulting from the Treaty of Versailles (the USA pushed to lighten them) (but at the same time, the USA demanded France to repay the war loans) ; several major Franco - American crisis revolved around debt payment! DID YOU KNOW THAT.....? 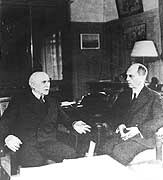 Up to 1942, that is to say almost two years after de Gaulle called upon occupied France to join the Allies against Germany on June 18, 1940, the US government still maintained diplomatic relations with Berlin, an ambassador in Vichy (Admiral Leahy) and relatively good relations with Vichy. During this very long period, the relations between de Gaulle and the US government were minimal, It is interesting to recall (few Americans know it) that on December 24, 1941, the small French archipelago of Saint-Pierre et Miquelon (off Newfoundland) voted to join de Gaulle's Free France and fight in the Free French Forces : in an ultimatum, Secretary of State Cordell Hull demanded the return of the Vichy Governor. Roosevelt kept supporting de Gaulle's opponents within the Free French organization and he survived politically only thanks to the faithful support he got from Churchill. It is fair to say that de Gaulle was not easy to live with (this is an understatement...) ; Churchill 's envoy to France, Major-General Edward Spears.said "Of all the crosses I have had to bear during this war, the heaviest has been the Croix de Lorraine." (it is the symbol of de Gaulle's Free French Army). DID YOU KNOW THAT.....? In the US and in France, the same historical events do not have the same name ! For example "the French and Indian War" is called "la guerre de sept ans" (the Seven Year War) by the French, "Bastille Day" is "le Quatroze Juillet" (July Fourteen), "the Civil War" is "la guerre de secession" (the Secession War), "the Revolutionary War" is "la guerre d'indépendance" (the Independence War), etc. 1940-1942 : the USA maintained an embassy in Vichy with the French collaborationist government. Read more about the German occupation of France. 1944 : after the Allied landing in Normandy, the US had planned a US military government in France (AMGOT) and de Gaulle had to struggle to install immediately a French civil one (he was not invited to Yalta a few months later). Americans like the most (and consider some of them American) : Jean Jacques Audubon, Jean Calvin, Pierre Simon du Pont de Nemours, Gilbert Motier de La Fayette, Alexis de Tocqueville, Jules Verne. Jean Jacques (John James) Audubon (Haïti 1785, New York 1851), emigrated from France to the USA in 1803 and became an illustrious American naturalist and painter. Jean Calvin (Picardie 1509, Geneva 1564) French theologian and religious reformer emigrated to Switzerland in 1534. Gilbert Motier de Lafayette (Auvergne 1757, Paris1834) commanded American troops in the Revolutionary War. His grave in Paris is a landmark for Americans. Pierre Samuel du Pont de Nemours (Paris 1739, Eleutherian Mills (USA) 1817), entrepreneur and economist. His son Eleuthere founded the Du Pont de Nemours and Co.
Alexis de Toqueville (Paris 1805, Cannes 1859) ; Americans know him for what he wrote about America but he also wrote one of the best analysis of the French Revolution. Jules Verne (Nantes 1828, Amiens 1905) author of science-fiction romances. 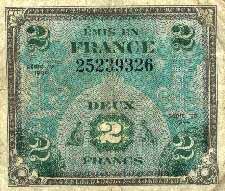 be ruled by US military governors, AMGOT had printed tons of a new currency (see above), etc.... De Gaulle discovered it on D-Day (which incidentally had not been disclosed to the Free French Government by its allies) and rushed to appoint the first " prefets " of delivered territories and restore democracy immediately with a legal government rapidly confirmed by free elections. With a little help from Churchill, AMGOT was dropped in France and never came in effect, but it was a serious wound to Franco-American relations. DID YOU KNOW THAT.....? Among the major European countries, France is the only one which has never been at war with the USA, as opposed to UK (1776 & 1812), Germany (1917 & 1941), Spain (1898), Italy (1942) and Russia (cold War). DID YOU KNOW THAT...? About ungratefulness : who started it? After the Revolutionary War and the Treaty of Alliance between the young American Republic and the old French kingdom, the French expected to develop fruitful commercial relations with America and they were shocked to see that the USA wanted to maintain their links with England. Later, when the new French republic was attacked by all the European kingdoms, they expected that America would help them to express its gratefulness, but George Washington had signed a secret treaty with England and did not help at all. For decades (in fact, the 19th century : see Roger), the image of the USA for the the French was that it was a scandalously ungrateful country. They were wrong. Emotions and feelings which make sense between indivuals do not make much sense between countries and this transposition could be seen as rather naive. DID YOU KNOW THAT....? The statue of Liberty ("la Liberté éclairant le Monde") was a gift from the French people to the American people for the centenial of the American Revolution, after a national citizen fund raising. The sculptor was Auguste Bartholdi and he built it in his yard 25 rue de Chazelles in the 16th arrondissement. The internal structure was designed by Gustave Eiffel (who built the Eiffel Tower). The 46-meter high statue was dismounted and transported to New York in 1884. 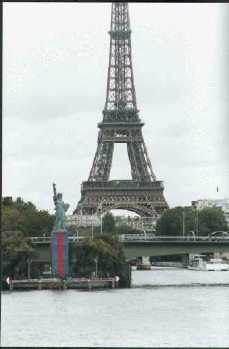 A smaller copy (11m50) was erected in 1885 on an island on the Seine, and it gives a great picture with the Eiffel Tower in the background (see it on the home page of this site). France is the European country which sent the least emigrants to the US but for many academics, studying and later teaching in the US is a must. Most of them come back to France (this is a national trait : most French emigrants come back home, even if they have spent their entire professional life abroad) but some of them remain in the USA and acquire American citizenship. This brain drain is particularly high and increasing in economics and biology, as analyzed in the NYT. USEFUL TIPS ..... When an American says " That's history ", it means " it's over, it's the past, it's meaningless now, etc ". For a French, it means something totally different : " it's been existing for a long time : it is part of our identity", or "it is grounded on ancient roots : therefore, it is solid, do not under-estimate it, etc.... " . In foreign policy, for instance, many French options connot be understood if they are not seen as grounded in history. To related pages : History 101 (#1), more French history (#3), the Gallic background (#4) and French revolutions (#5), American firms in France, 112 questions by US GIs, etc.